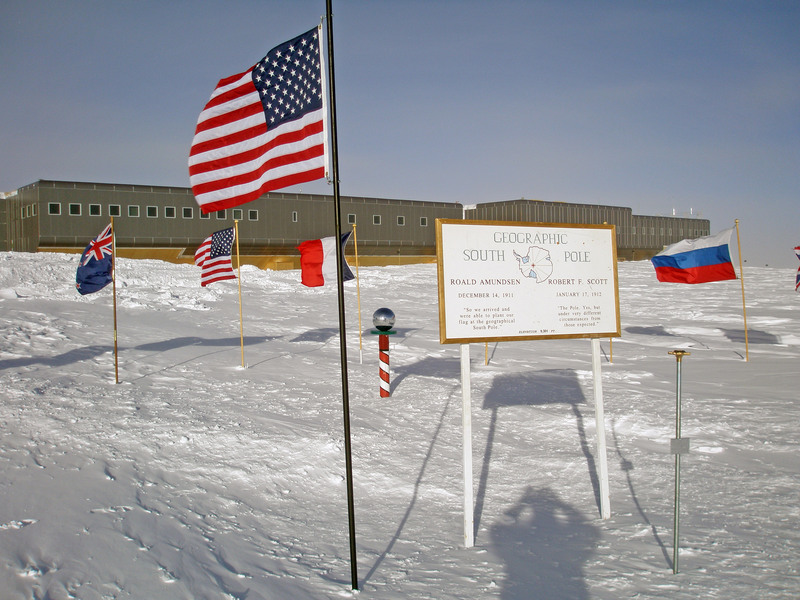 View of the South Pole, both ceremonial and geographical. (The Ceremonial Pole is the red-and-white striped pole with the mirrored ball. The Geographic Pole is the bronze marker on a silver rod. Both Poles were moved this year. The Geographic Pole is moved about 10 meters every year, as the glacier moves and carries the previous marker about 10 meters away from the Pole every year. The Ceremonial Pole is only moved when necessary (for example, to keep it from being buried by accumulating snow), or, as it was this year, when it is thought that a move would make the Pole more photogenic. The Ceremonial Pole was moved to a spot front and center of the new station for the New Station Dedication on 12 January 2008.